AC Milan are reportedly focusing on strengthening their midfield, with Sergej Milinkovic-Savic and Tiemoue Bakayoko linked with the club. The Rossoneri have signed Mattia Caldara to add defensive solidity and to fill the void left behind by Leonardo Bonucci, while the arrival of Gonzalo Higuain gives them a clinical edge in the final third. 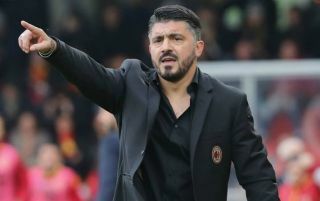 In turn, having strengthened at either end of the pitch, the focus may potentially now switch to the midfield, with Gennaro Gattuso forced to heavily rely on his preferred trio of Giacomo Bonaventura, Lucas Biglia and Franck Kessie last season due to a lack of quality and depth. That could change as speculation suggests that Milan are prioritising a midfielder next, with Calciomercato reporting, via Sky Sport Italy, that Lazio ace Milinkovic-Savic remains their ‘dream signing’. Given Calciomercato note in a separate report that the Serbian international is valued at €155m by Lazio, it’s easy to see why it may likely remain a dream for Milan as it’s questionable as to how they could put together a financial package to land his signature while avoiding falling into trouble with FFP rules. Having already battled to overturn their European ban this summer, the last thing that the Italian giants need is to give UEFA another reason to be concerned with their finances. Meanwhile, perhaps a more realistic option to bolster the midfield could be Chelsea ace Bakayoko, with respected Sky Sport Italy journalist Gianluca Di Marzio reporting that discussions have taken place over the 23-year-old moving on an initial loan deal with an option to buy. Bakayoko struggled in his first year with Chelsea last season, but it’s easy to forget how he impressed for Monaco prior to that. Perhaps a move to Italy, with a slower tempo than the Premier League, could prove to be key in helping him rediscover his best form and as an ideal alternative to Kessie in the combative midfield role.